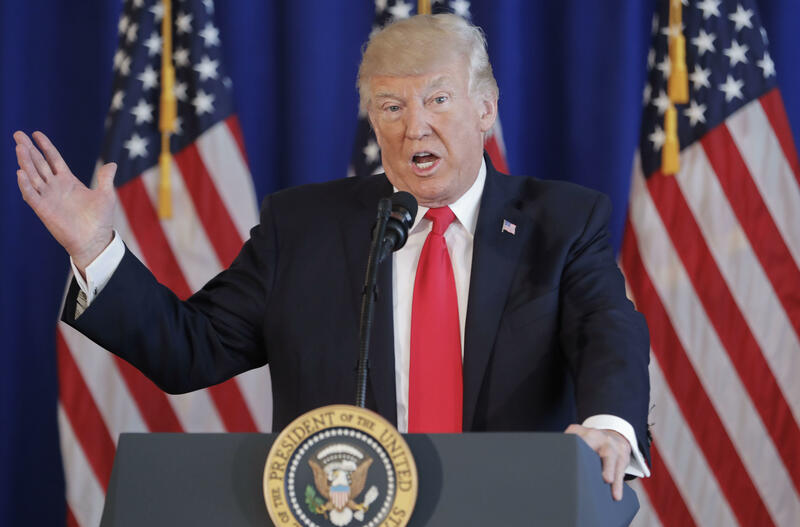 BEDMINSTER, N.J. -- The White House on Sunday defended President Trump's reaction to the events that rattled Charlottesville, Virginia the previous day. A day of violent clashes between white nationalists and counter-protesters ended with a car slamming into the counter-protesters, killing one woman and leaving 19 others injured. "The president said very strongly in his statement yesterday that he condemns all forms of violence, bigotry and hatred, and of course that includes white supremacists, KKK, neo-Nazi, and all extremists groups. He called for national unity and bringing all Americans together," a White House spokesman said in a statement. Vice President Mike Pence, traveling in South America, condemned "these dangerous fringe groups" and said they "have no place in American public life and in the American debate." In Cartagena, Colombia, Pence responded to a reporter's question about the violence in Charlottesville and said, in part,"We have no tolerance for hate and violence, white supremacists or neo-Nazis or the KKK. These dangerous fringe groups have no place in American public life and in the American debate, and we condemn them in the strongest possible terms." On "Face the Nation" on Sunday, Leon Panetta, who previously served as White House chief of staff, defense secretary and CIA director, said the president's failure to call out the groups by name sends the wrong message. "His failure to address what really happened in Charlottesville, and the role of white supremacists, I think also sends a message that he is not recognizing the real causes of crises even within our own country," Panetta said. Mr. Trump, on a working vacation at his New Jersey golf club, addressed the nation Saturday soon after a grey Dodge plowed into a group of anti-racist counter-protesters in Charlottesville, a college town where neo-Nazis and white nationalists had assembled to march. The president did not single out any groups in his remarks, instead accusing "many sides" of violence. Mr. Trump condemned, "in the strongest possible terms this egregious display of hatred, bigotry and violence on many sides, on many sides." He added: "It's been going on for a long time in our country. Not Donald Trump. Not Barack Obama. It's been going on for a long, long time." The president did not answer questions from reporters about whether he rejected the support of white nationalists or whether he believed the car crash was an example of domestic terrorism. Aides who appeared on the Sunday news shows said the White House did believe those things, but many fellow Republicans demanded that Mr. Trump personally denounce the white supremacists. Sen. Cory Gardner, R-Colorado, tweeted: "Mr. President -- we must call evil by its name. These were white supremacists and this was domestic terrorism." Added Sen. Marco Rubio, R-Florida: "Nothing patriotic about #Nazis,the #KKK or #WhiteSupremacists It's the direct opposite of what #America seeks to be." GOP Chris Christie of New Jersey, a staunch Trump supporter, wrote: "We reject the racism and violence of white nationalists like the ones acting out in Charlottesville. Everyone in leadership must speak out." And Democratic Gov. Terry McAuliffe of Virginia, who spoke to Trump in the hours after the clashes, said he twice "said to him we have to stop this hateful speech, this rhetoric." He urged Mr. Trump "to come out stronger" against the actions of white supremacists. "I certainly think anytime that you commit an attack against people to incite fear, it is terrorism," McMaster told ABC's "This Week." "It meets the definition of terrorism. But what this is, what you see here, is you see someone who is a criminal, who is committing a criminal act against fellow Americans." The president's homeland security adviser, Tom Bossert, defended Mr. Trump's statement by saying that some of the counter-protesters were violent, too. When pressed, he did specifically condemn the racist groups. The president's daughter and White House aide, Ivanka Trump, tweeted Sunday morning: "There should be no place in society for racism, white supremacy and neo-nazis." White nationalists had assembled in Charlottesville to protest against the city's plan to take down a statue of Confederate Gen. Robert E. Lee. Counter-protesters massed in opposition. On Saturday, after hours of violent encounters between the two groups, a car drove into a crowd of people peacefully protesting against the white nationalist rally. The driver was later taken into custody. Alt-right leader Richard Spencer and former Ku Klux Klan leader David Duke attended the demonstrations. Duke told reporters that the white nationalists were working to, "fulfill the promises of Donald Trump." Mr. Trump's reaction drew praise from neo-Nazi website Daily Stormer, which wrote: "Trump comments were good. He didn't attack us. He just said the nation should come together. Nothing specific against us... No condemnation at all." Mayor Michael Signer, a Democrat, said he was disgusted that the white nationalists had come to his town and he blamed Mr. Trump for inflaming racial prejudices with his campaign last year. "I'm not going to make any bones about it. I place the blame for a lot of what you're seeing in America today right at the doorstep of the White House and the people around the president," he said. Mr. Trump, as a candidate, frequently came under scrutiny for being slow to offer his condemnation of white supremacists. Meanwhile, the University of Virginia (UVA) office of the president Teresa A. Sullivan released a statement on Sunday calling out the violence and offered condolences to the lives lost over the weekend.